The Maya Q’anjob’al Nation takes their defense of land and life in Huehuetenango transnational through community organizing in both Guatemala and the U.S. Caya Simonsen worked for 6 months as a NISGUA accompanier in Huehuetenango and shares her experience visiting the Maya Q’anjob’al Nation in both Guatemala and her hometown of Omaha, NE. 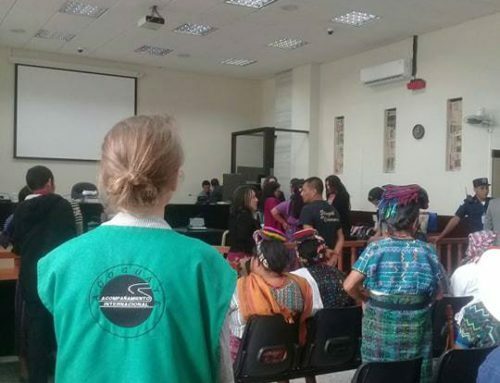 Through its Guatemala Accompaniment Project (GAP), NISGUA provides accompaniment through ACOGUATE to Guatemalan human rights defenders who are threatened for their work denouncing impunity, advancing social justice and defending life and territory. The monitoring and reporting done by accompaniers like Caya serves to alert the international community to take immediate action in the defense of human rights. When I left Omaha, Nebraska, in early March of this year, I had no idea that my hometown would become a frequent topic of conversation during my time as an accompanier. Over a warm glass of atole, or a delicious dinner graciously hosted for us in Jolom Konob’, the capital of the Maya Q’anjob’al Nation (also known as Santa Eulalia, Huehuetenango), people we accompanied would tell me of their time spent working in Omaha or about family members who live there. While attending events celebrating the defense of indigenous territory and self-determination, I would often hear public acknowledgement given to supporters in Nebraska listening to the event over a livestream. This gave me a window of understanding to the deep commitment of Q’anjob’al immigrants in the United States to support their people’s resistance back home. While I was on an accompaniment trip in Jolom Konob’, a member of the Gobierno Plurinacional (or Plurinational Government) put me in contact with their delegates in Omaha, Nebraska. The Gobierno Plurinacional is a sovereign ancestral government of the Maya Akateko, Chuj, Popti, and Q’anjob’al Nations in Guatemala’s Huehuetenango Region, and also has four chapters of this sovereign government in the United States, including in Omaha, Nebraska. 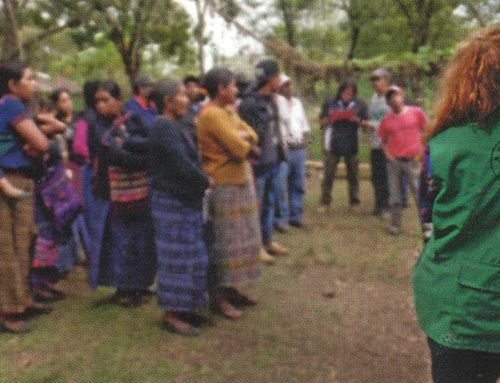 As an international human rights accompanier with NISGUA, I accompanied many leaders of this organization in their resistance to the forced imposition of extractive industry projects in Q’anjob’al and Chuj territory. 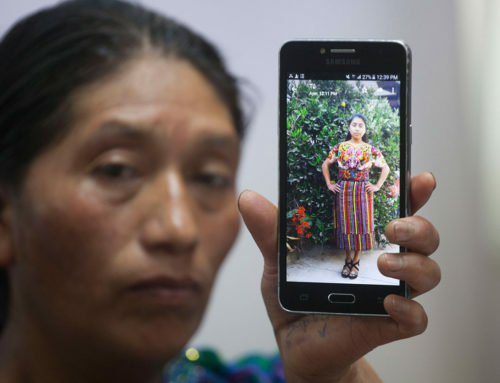 Over the course of the past 500 years, indigenous peoples in Guatemala have been resisting colonization, forced labor, the theft of their lands, and genocide. Today, they continue to resist what they have named the fifth pillage of their territory: mining, hydroelectric projects, and other forms of resource exploitation. I accompanied leaders defending their territory from these types of projects in places such as Ixquisis, where the Ministry of Energy and Mines granted licenses authorizing the construction of the hydroelectric projects Pojom I, Pojom II, and San Andres despite the communities’ previously self-organized consultation which decidedly rejected extractive projects with a vote of 25,646 against and only 1 in favor. The large-scale construction of these hydroelectric dams owned by the company Energía Renovada, formerly known as PDH S.A., continues to this day, violating the surrounding communities’ right to self-determination and threatening their access to the rivers which they depend on for farming, drinking water, bathing, and daily use. 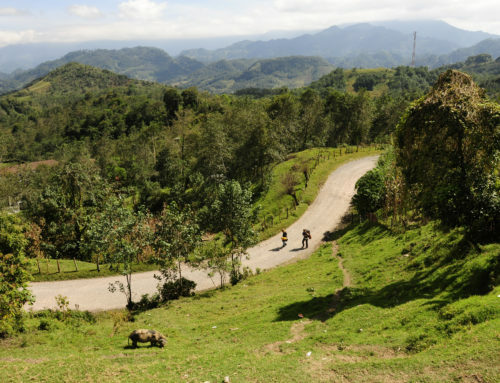 The local Chuj, Q’anjob’al, Akateko, and Mestizo populations face a militarized response to their resistance: the installation of a military base and police station on the hydroelectric company’s private property in 2014, the killing of Sebastian Alonso Juan during a peaceful protest on January 17, 2017, and the criminalization and repression of subsequent protests. I was in these communities and heard the strife of the people who have lived under escalating threats to their safety during the seven years they have been in resistance to this company’s presence in their territory. I was also present in times of celebration. On April 8, 2017, I had the honor of attending my first public event as an accompanier, at the fourth anniversary of the successful resistance to Hidro Santa Cruz S.A. in Barillas. 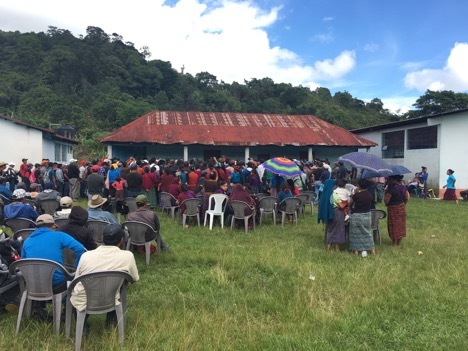 Through an entire morning of speaking and community education, they celebrated their two years of permanent encampment blocking the entrance of machinery to the site where this Spanish company attempted to construct a hydroelectric project on their sacred Q’anbalam River. Their resistance resulted in the company announcing its withdrawal from the country in December of last year. The celebration ended with over four hours of marimba dancing. Though I had never before seen this type of dance in my life, as guests of honor, my accompaniment partner and I were called upon by the event leaders to start the dance. Six months later, I attended a marimba event in Omaha, Nebraska shortly after my return from Guatemala. On October 28, 2017, a Q’anjob’al organization in Omaha called Pixan Ixim, meaning Heart of the Corn, and the delegates of the Q’anjob’al Government organized an event for Dia de los Santos. I was introduced at the event as a special guest who had been in contact with them while in Q’anjob’al territory. Back at home, I now had the opportunity to see in-person the cross-border solidarity of the Q’anjob’ales in the United States and to learn more about how the Q’anjob’al Government in Omaha organizes their people to support the resistances in Q’anjob’al territory. It was meaningful for me to be welcomed into that space, listening to the melodies of an instrument that had been imported from Jolom Konob’ to be heard in Omaha, Nebraska, and meeting people who are so closely linked with the human rights defenders I spent six months accompanying. Since my return, I have also had the opportunity to speak with teachers at the Omaha Public Schools Annual English as a Second Language Conference about my experience in Guatemala and my previous experience working at a shelter for immigrants on the U.S.-Mexico border. I hoped to help the teachers have more context for what their students may have faced in their journey to the United States —the controlling and surveillance of humanity that takes the form of border fences, immigration checkpoints, and short and long-term immigration detention centers. There are many connections between my time providing hospitality to immigrants and my work as an accompanier in Guatemala. 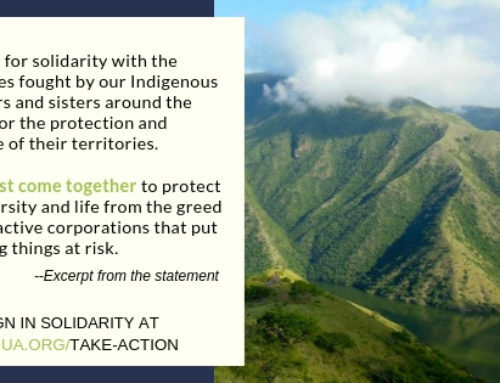 The struggle for self-determination; and the right of indigenous peoples to exercise their culture, practice religious traditions, and have an interconnected relationship with the earth, is continually threatened in a world of overconsumption, resource exploitation, and state violence in the defense of private companies. This attack on self-determination in Guatemala has led to an economic system based on exploitation, now a root cause of many Guatemalans’ immigration to the United States. The organization of the Q’anjob’al community in Omaha to support the continued struggle in their territory back home and to continue living their cultural traditions here, is a powerful example of the interconnectedness of a resistance which can transcend over 2,000 miles of physical separation. Attending the marimba event in Omaha immediately brought me back to the time I spent accompanying resistances in Q’anjob’al and Chuj territory. I’ve now been reflecting on how international solidarity can continue across the distance. Our choices and actions in Omaha, Oakland, or Philadelphia – wherever we find ourselves – can support indigenous self-determination here at home and all around the world. I hope that we can be creative about taking continued action to be in solidarity. 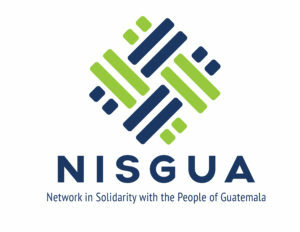 One concrete way you can show solidarity with movements for self-determination in Guatemala is to sign up for regular updates from NISGUA and sign the action demanding that U.S. Senator Heller of Nevada stop advocating on behalf of a corporation responsible for abuses in Guatemala.